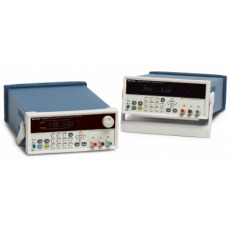 Every Tektronix DC power supply offers a wide voltage and current range, plus fine setting resolution, so you can precisely generate the power you need to satisfy many different applications. Less than 5 mVp-p noise means you can be confident in the DC power supply's output value. The available numeric keypad makes voltage and current setup fast and accurate. With the PWS Series, you can generate the power you need for your application - simply and accurately.